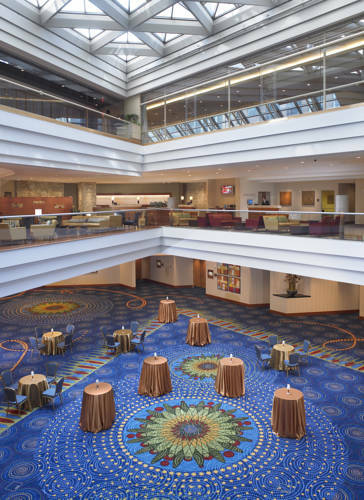 Discover the contemporary style and unbeatable location of Minneapolis Marriott City Center. Situated in the city's lively downtown district, our hotel is attached to the Skyway system and within walking distance of Target Center and Nicollet Mall. Enjoy sweeping Minneapolis skyline views from our tranquil, pet-friendly hotel rooms and suites, offering deluxe bedding, high-speed Wi-Fi access, ergonomic desks and premium bathroom amenities. Choose our bi-level Skyloft Suites, tailor-made for longer stays, to access our exclusive M Club Lounge. During your stay, enjoy delectable American cuisine at Northern Shores Grille, or workout at our 24-hour fitness center. Host your next special event at our hotel, boasting 46,690 square feet of venue space in a prime downtown location near the Convention Center. Our downtown hotel is also near the area's most popular attractions. Offering effortless access to the Skyway system, our contemporary hotel is ideal for both guests exploring Minneapolis and business travelers. Northern Shores Grille: Northern Shores Grille features a wide range of American classics, as well as regional specialties. Start your day in downtown Minneapolis with a hearty breakfast, our visit our hotel restaurant for a meal and a cocktail after an eventful afternoon.